I really should know better than to read these, I become immersed in a story. Luckily for me the author has set this book up with alternating chapters. A wonderful story of family then a dash of despair as we go from before and after. Our kitchen was full of chatter and laughter. We each appreciated the mealtime as an opportunity to talk about our day, hear about everyone else's, and discuss any news or happenings. We never fuelt rushed and, while my sisters and I may have bickered at other times, we never did so during meals. Eating together around our table was our time for solidarity. It was sacred and cherished. Our "home" had become a house. A place to store our clothes. A place to sleep. A place where we could hide in our rooms and cry. I haven't finished the book, just wanted to get some of my impressions down while fresh. Part two is all about the after. Twenty-four chapters of trying to deal with life afterwards. Thankfully they are short so I'm able to read a couple then do something life affirming before going back to read a couple more chapters. The father is basically a zombie trying to deal with settling estates and a lawyer the rest of the family don't like. I think, as does Lynda, that he got railroaded into accepting a deal. But having never gone through something like that I can't even imagine the logical thought process that is lost through grief. Sad to be finished but extremely satisfied that I read Repairing Rainbows. This is a book about tragedy. It is also a book about hope and perseverance. A book about choices. 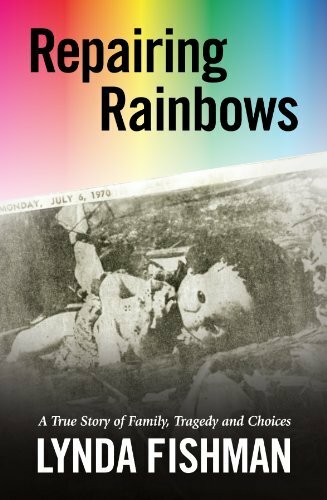 Repairing Rainbows is a beautiful book. Lynda and Barry are wonderful people. I'd love to be in their sphere of influence...maybe I can. I may not be able to work for, or with, her but there are lessons that she learned, lessons shared with us, lessons I can learn from. We have choices. We always have choices. Thank you to Nicole of Tribute Books for sending me a copy of this book in exchange for an honest review. Gina, I really admire the approach you took to your review. It's very compelling to read your thoughts as you were making your way through the book, and I appreciate how you listed the book's dedication as a powerful point that drew you into the book. Something as straightforward as that can make a big impact. And I really like how you selected excerpts that described Lynda's home life before and after the tragedy to compare and contrast how her life completely changed. You selected very telling passages.